teenage years, and her still-unsettled adult life. The stories culminate with a novella featuring Nora Jane’s quirky family trying to cope with a life-threatening illness. so far this year. Nora Jane progresses from a rebellious teenager to a responsible (but feisty) adult, and Gilchrist is really able to show the slow metamorphosis with her writing style and what she chooses to reveal about Nora Jane. 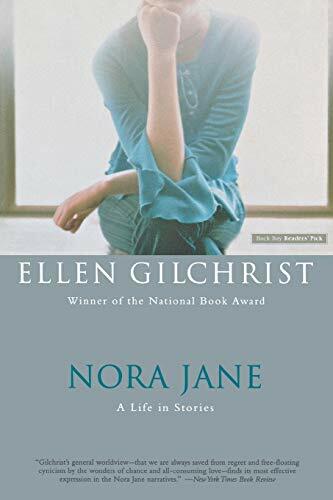 Nora Jane and the other main characters are endearing in how real they are, which is definitely helped by Gilchrist never hesitating to put them in true-to-life situations, whether they’re heartening and uplifting or painfully sad. Nora Jane is literary without any pretentiousness – it’s just a great story that’s very well written. Be sure to check it out. corner of Laurel and Webster streets. It was there that Nora Jane was happy. ears, their green veins so like the ones on Nora Jane’s grandfather’s hands. and made each other cry. as everybody else in the world. Introduction to the Electron Microscope. This was not an unbidden move. Barbara Gowdy; Astonishing Splashes of Colour by Clare Morrall. Fun tidbit: Gilchrist’s book Victory Over Japan won the National Book Award in 1984. Japan to my TBR, so yes.